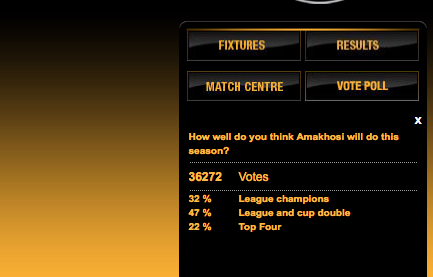 According to a poll by Amakhosi on their official website, only 47 % believe Amakhosi will take the League and cup double. 32 % believes Amakhosi will be League champions and 22 % believe Amakhosi will only make Top Four . The poll was taken by 36 272 participants. How well do you think Amakhosi will do this season?